The entire Paris region's public transportation system will be free this weekend in an effort to stem the early spring smog. Take public transport in Paris this weekend, and it will cost you nothing at all. Last night, the President of the Île-de-France region announced that, as of 5:30 this morning, the entire Paris regional network would run free of charge until at least Sunday evening. The move comes not from a sudden enthusiasm for greener forms of transport, but because air pollution across France is currently at appallingly high levels. Following unseasonably warm weather throughout March, over 30 French Départements are on maximum pollution alert as the volume of particulates in the air skyrockets. The state hopes that by encouraging people to leave their cars at home, they may be able to massage pollution down to more manageable levels. Given the noxious yellowish fug lurking over Paris streets right now, accompanied by a rise in hospital visits for asthma, the measures couldn’t come sooner. Indeed, Paris's radical intervention may be just a taste of things to come across Europe, as cities struggle to cope with weather patterns made more extreme and unpredictable by climate change. The irony of Paris's problems is that they are a result of what looks like glorious weather. While icy cold has been gripping the Eastern half of North America like a vice, Northern Europe has had an extremely mild winter and is on track for the warmest March on record. With sunshine breaking across the continent, Paris temperatures have risen comfortably above 70 degrees. The problems come at night, when temperatures at ground level cool faster than in the upper atmosphere, trapping exhaust fumes in a bubble that cannot rise and disperse. These fumes consist mainly of tiny, breathable particulates, stemming from many sources but particularly from diesel-powered cars and trucks, which make up an estimated 60 percent of all French vehicles on the roads. High atmospheric particulate levels bring severe health risks with them, notably as a cause of cancer and cardiopulmonary diseases. Figures from the World Health Organization suggest particulate pollution is behind up to 42,000 premature deaths annually in France alone. After a week of sunny days and cold nights, much of France’s air has become a sort of toxic stew. And Paris is by no means the only region affected. The northern cities of Caen and Rouen are also laying on free public transport until Sunday, with Reims and Grenoble offering a free commute for today alone. Such measures might seem drastic seen from the United States—they will cost the Paris region €4 million per day and will include making the city’s bike-share scheme free to use—but in France they are already being damned as too little, too late. Right-leaning daily Le Monde has criticized the plans as "timid." The week-long delay in implementing them, it says, reflects 20 years of inertia in France during which the motorist lobby and manufacturers of diesel-powered vehicles have stifled legislation and debate. While this is substantially true, Paris and France are not alone in struggling to soften the blow of increasingly erratic, unseasonal weather patterns. Across the channel, London’s winter has been quite warm too, though it also brought an almost biblical plague of endless rain. Dispelling hopes that climate change might have the modest compensatory effect of making British weather more clement, the constant showers put much of the country under water. So far, London has been largely protected from flooding. 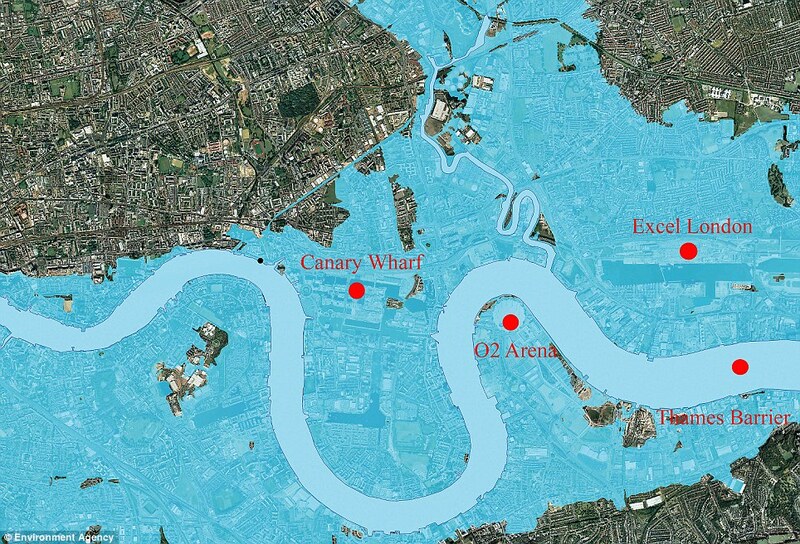 Downstream floods on the Thames generally happen before the river reaches West London, while in the East, high tides from the sea can be halted by the Thames Barrier. This winter, however, the barrier was pushed to its limits. It has been raised 50 times to regulate river levels, the maximum number of times Britain’s Environment Agency recommends per year if essential maintenance is to be carried out. As the Environment Agency graph below shows, this is a massive hike for a barrier that has only been raised 182 times in total since being opened in 1982. With London’s flood risks growing yearly (and the Thames potential floodplain vast) the Environment Agency is investigating whether the barrier—which has performed excellently up until now—is still up to the job. At least both Paris and London are acknowledging the need for action on pollution and environmental problems exacerbated by climate change, even if they are doing so following the threat of heavy fines by the European Commission. The problem is that, as climate change progresses, issues like France’s early spring smog and a rising Thames may well no longer be isolated incidents. They could easily become regular threats that necessitate radical action if citizens are to continue living safe, healthy lives.